It’s so fun to decorate the house for each season and all the holidays. It can get expensive though and who has time to spend hours! 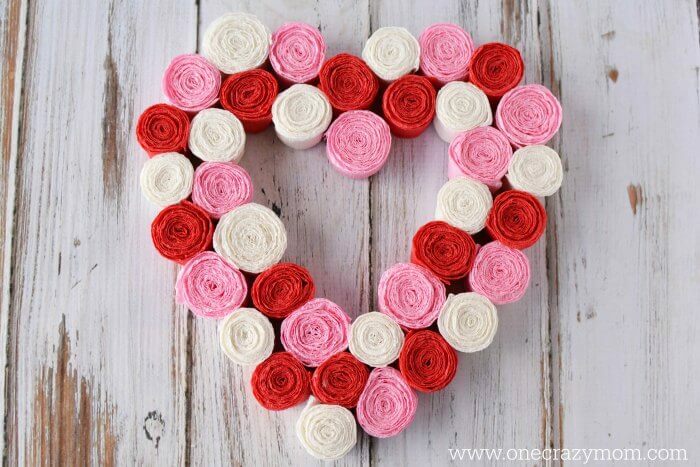 This heart wreath is the perfect solution for Valentine’s Day. 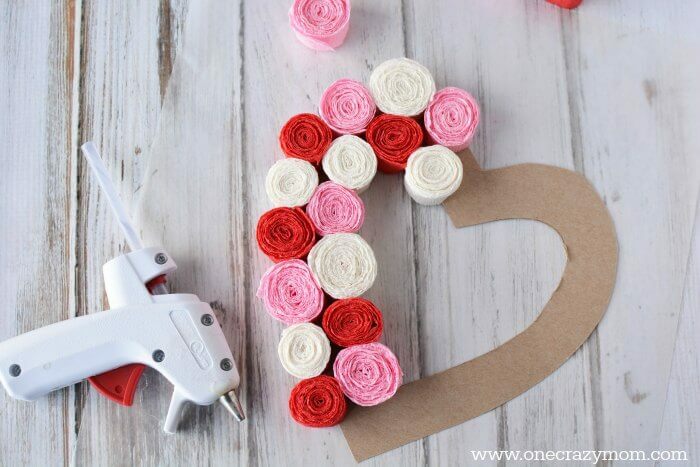 It’s inexpensive and simple to make! The outcome is so pretty with all the pink, red and white. Your house will look so festive. Plus, the kids can help. The wreath is made with crepe paper so the kids can help roll each section. They will love helping! Even better, most of these items can be found around the house. All you really need to get is some crepe paper. I had leftover red ribbon from Christmas that is perfect to hang this wreath. 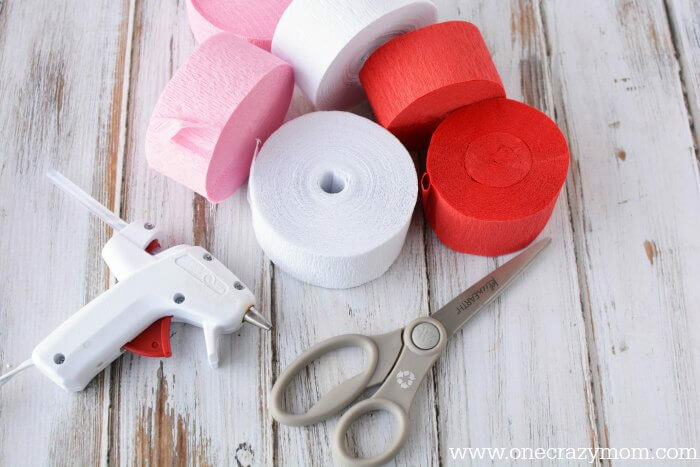 If you don’t already have a glue gun, you will for sure need one! These are so hand. I bought my glue gun on Amazon. 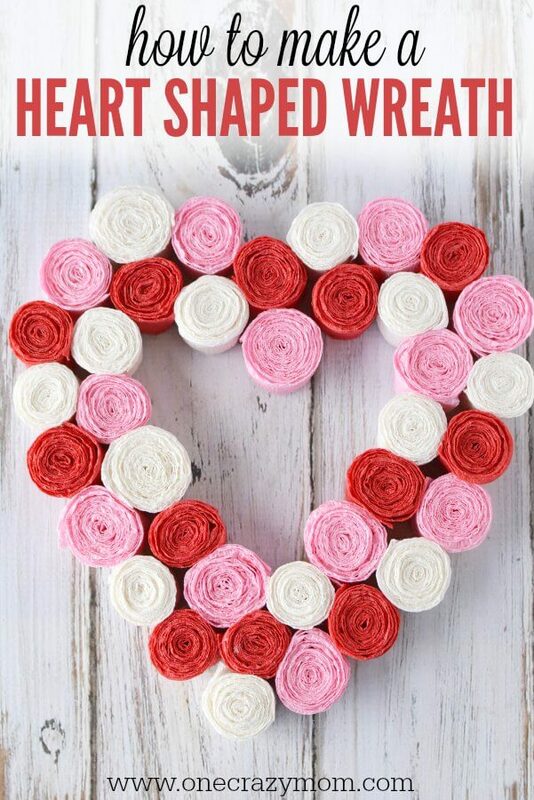 Let’s get started making this heart wreath! A few tips for making this wreath. Sometimes it can vary how much material you will need. You want the wreath to be nice and full without any gaps in between. I used just less than 1 roll of each color and I made about 20 flowers of each color. However, I only used 12-13 of each color on the heart shape. 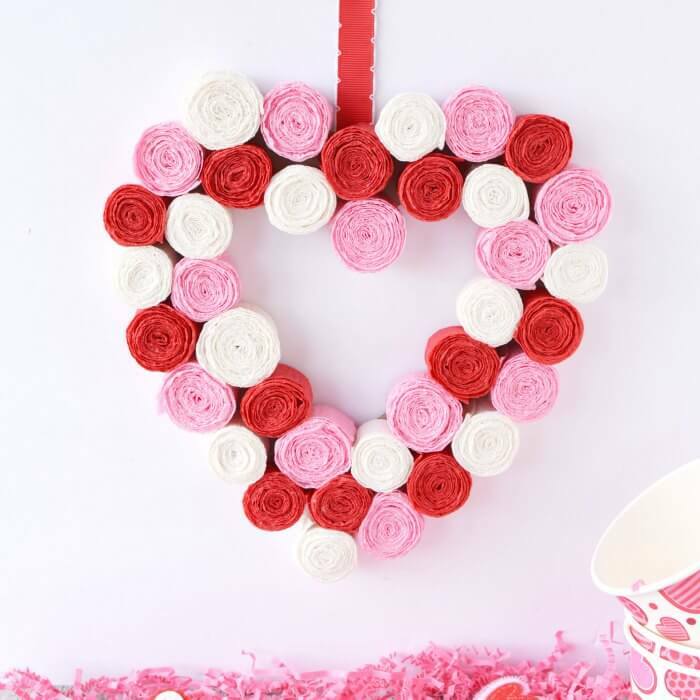 The heart cardboard shape measures 7″x8″. Obviously the flowers extend a bit beyond the outside of the cardboard. 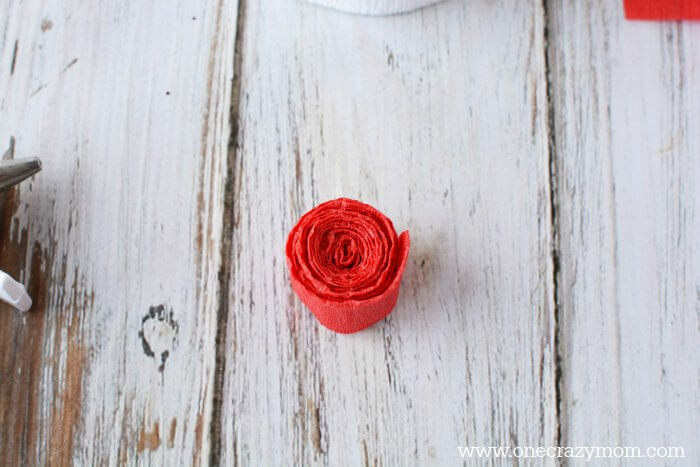 So, you’ll need 12-13 flowers of each color to create this project. Remember, it doesn’t have to be perfect and each one will vary. Just have fun and it will turn out great! 1. 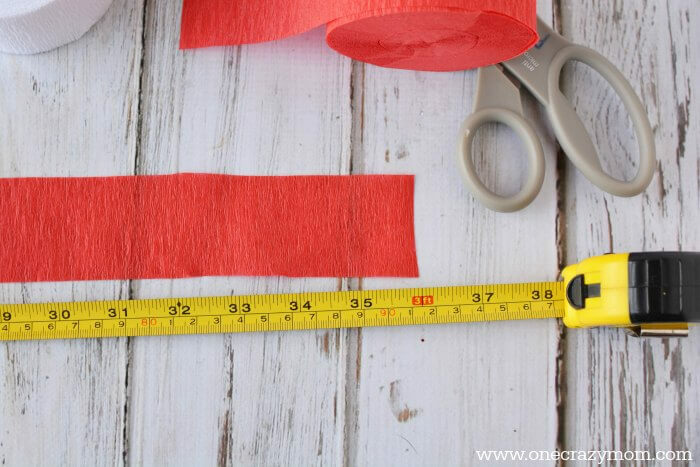 Measure each piece of crepe paper to be 36″ or 3′ in length and cut. 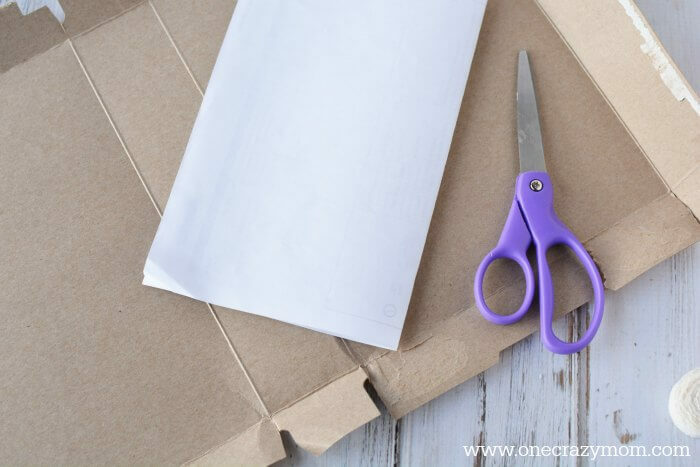 Fold paper in half lengthwise and begin to roll the end. 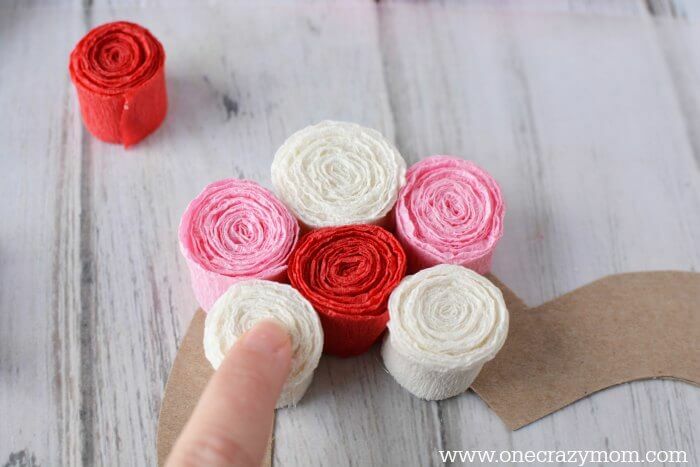 Continue to roll the paper into a flower shape. 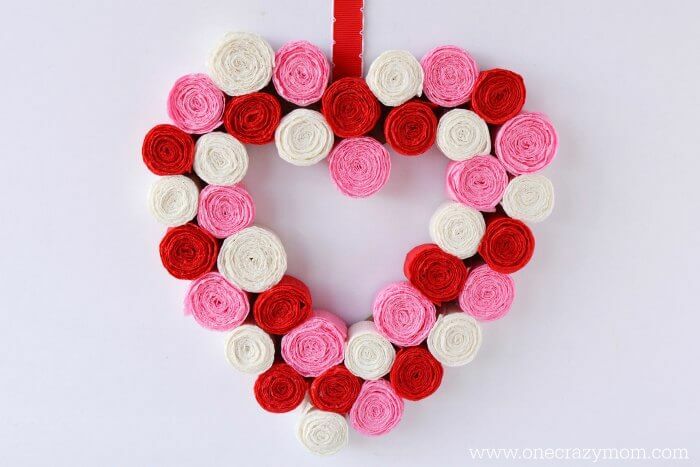 Do not pull tightly, Just use enough tension and tightness to keep the flower shape. Secure the end with hot glue. Repeat until you have about 13 flowers per color. 2. 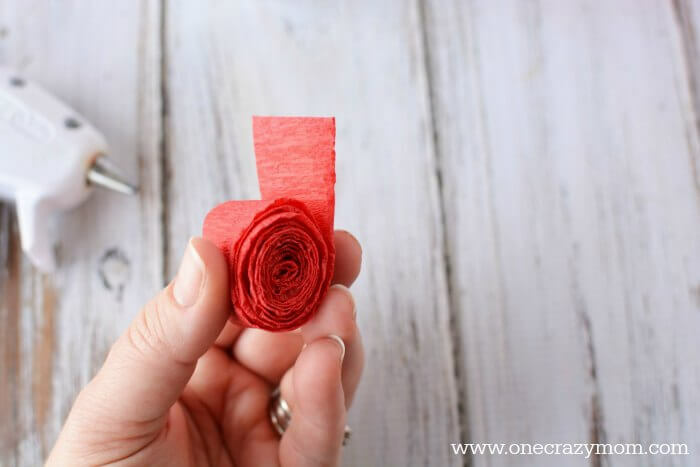 Fold a scrap piece of paper in half and cut out a heart. Place 2 of your flowers next to each other and measure how wide they are. 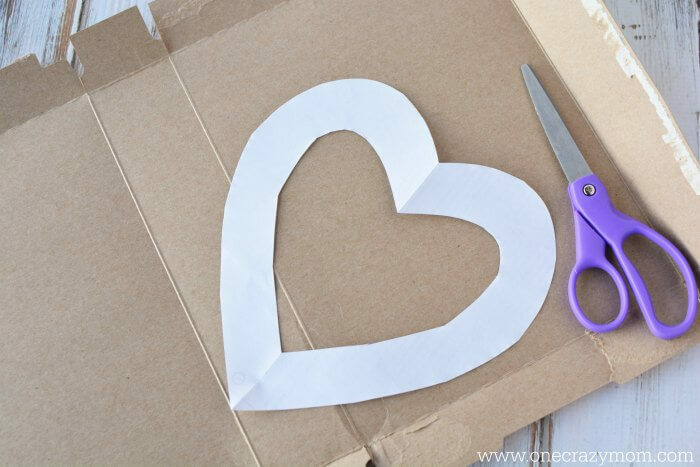 Use that measurement to cut a wide center piece out of the cardboard heart. 3. 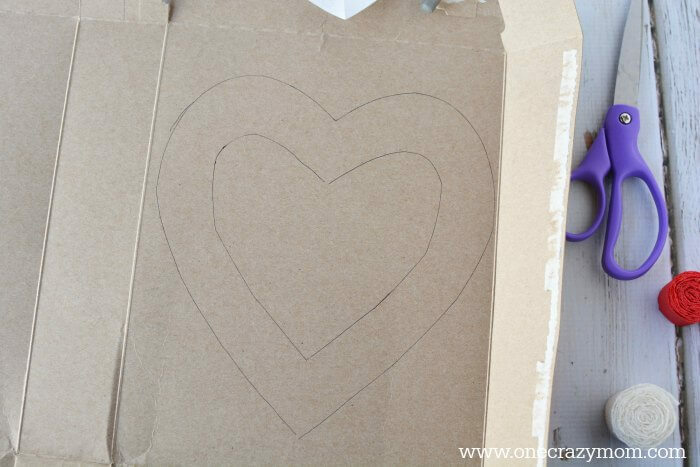 Place the cardboard heart onto a flat, protected surface. I like to use wax paper. 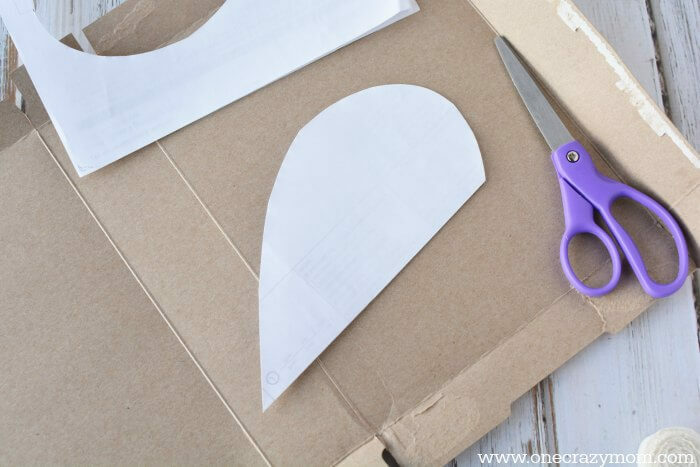 Place the flowers on the cardboard in a pattern that works for the size flowers you have. 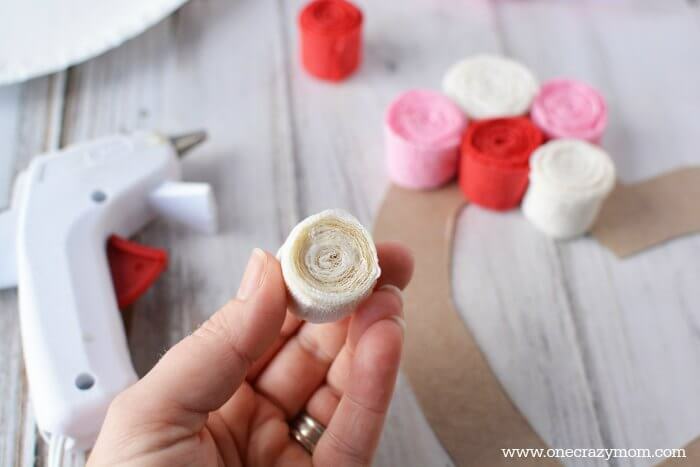 Adhere by adding hot glue to the flower or onto the cardboard and pressing the flower firmly on the cardboard. Continue until the entire cardboard heart shape is covered. 4. 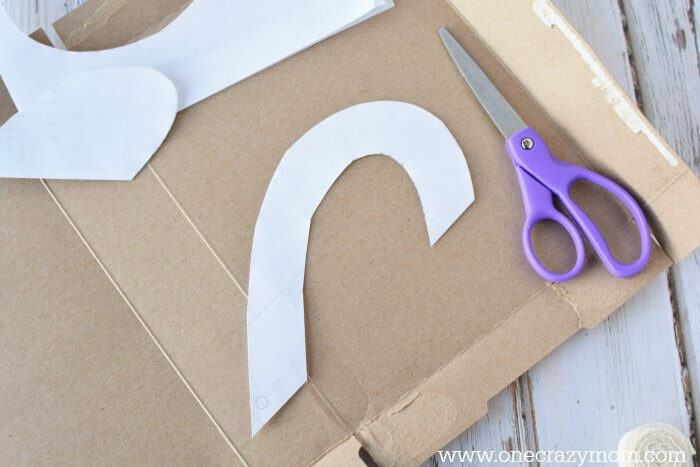 Cut a piece of ribbon and affix it to the back of the cardboard with hot glue for hanging. 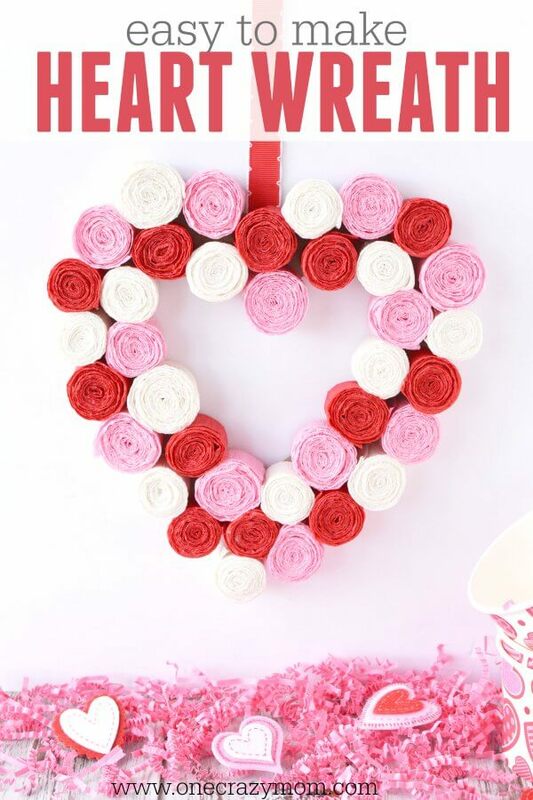 This cute heart shaped wreath is going to look so festive in your home! 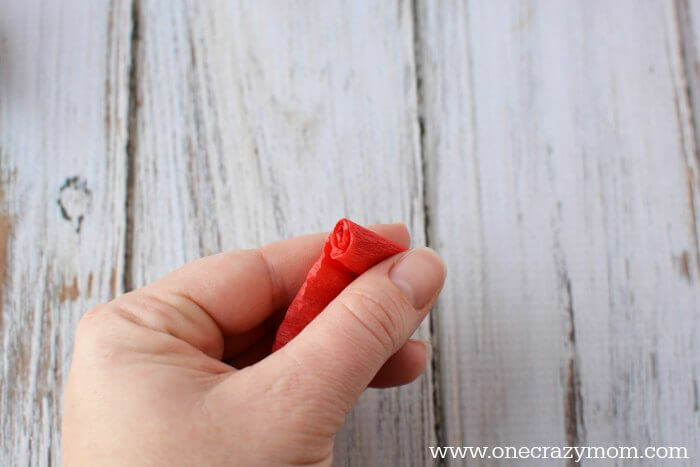 It’s so fun to make little crafts and decorations with your kids. They will have a blast helping and you will cherish the memories for years to come. 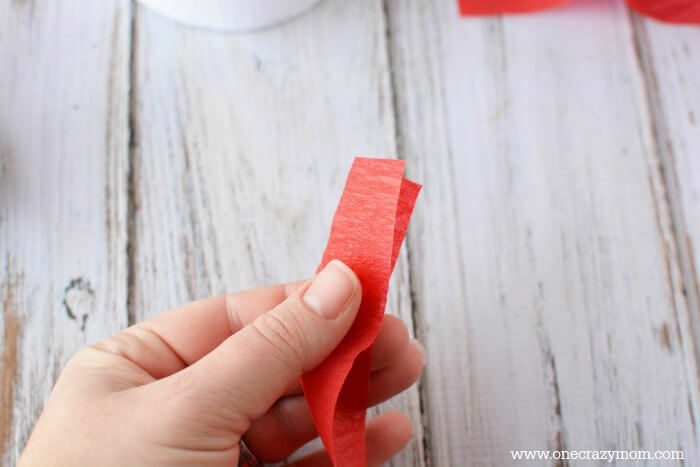 Let the kids help roll each section in the various colors. Perfect Baby Shower gift – Order a FREE Nursing Cover in a variety of styles!